The Coronet Theatre, in Notting Hill Gate, was built for the impresario Edward George Saunders to the designs of the theatre architect, W.G.R. Sprague. The builder was Walter Wallis of Balham and the cost approximately £25,000. It was described in The Era, the weekly theatrical newspaper of the time, as a theatre of which the whole County of London may be proud. 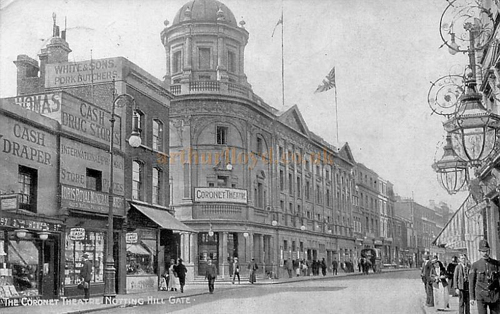 The Coronet opened on 28th November 1898 with a performance of the opera The Geisha, despite the fact that Saunders had not yet been granted a licence by the London County Council as the building was unfinished. Saunders was prosecuted and fined. The theatre had a seating capacity of 1,143 in stalls, dress circle and gallery with boxes at each side of the auditorium, next to the stage. The stage was 35 feet deep, stage left 27’6″, stage right 27’0”, full width 50 feet and the proscenium with 28 feet wide. 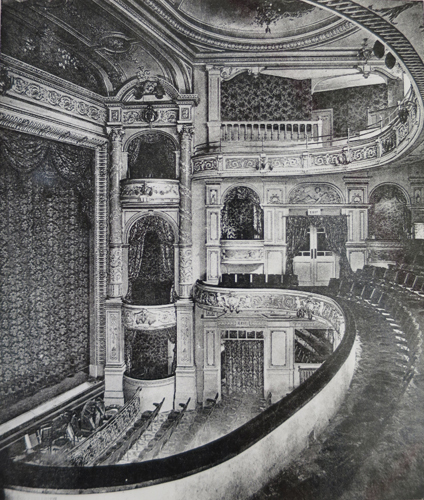 A photograph and a description of the theatre appeared in the edition of 26th of November 1898 of The Era . “The scheme of decoration is a harmony of gold and a striking feature is the handsome decorated columns that rise each side of the boxes near the proscenium, of which there are eight, all of them exceedingly convenient and differing in size, their construction being novel and picturesque. 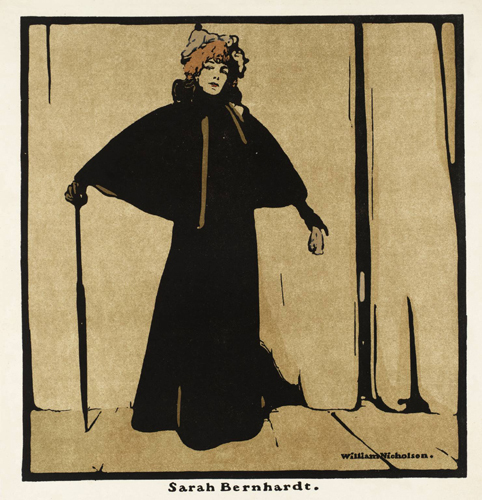 Ellen Terry and Sarah Bernhardt, leading actresses of the day, both appeared at the Coronet. 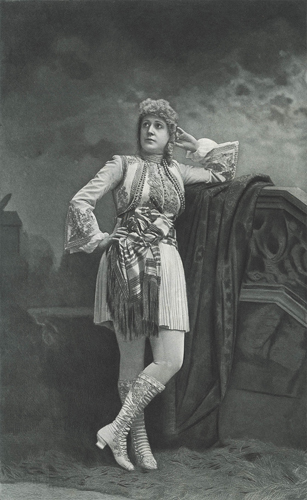 Terry (1847-1928) was England’s leading female Shakespearian, and Bernhardt (1844-1923) was described by Robert Gottlieb of The New Yorker, as the most famous actress the world has ever known. 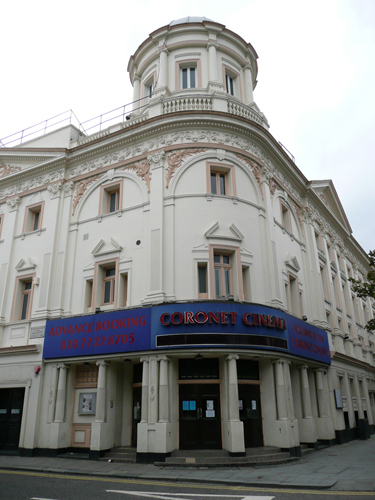 However, the Coronet’s high theatrical aspirations suffered from its being too far from the West End, and in 1916 films were shown in the theatre for the first time as part of variety shows. In 1923, it became solely a cinema, with its seating reduced to 1,010. The stage was blocked off and the screen fitted within the proscenium arch. The dress circle bar became the projection room. In 1931, the cinema became part of Gaumont British, and the theatre boxes were removed. In 1950, it was renamed the Gaumont and the upper tier was closed for seating and capacity reduced to 196 in the dress circle and 319 in the stalls, a total of 515. During World War II the basement below the stage was strengthened for use as an air raid shelter and a brick enclosure to the basement stair built on the Uxbridge Street pavement. In 1972, the Rank Organisation (which had taken over Gaumont) proposed to demolish the building, but a local campaign secured its survival. The building was refurbished and sold to independent operator Panton Films in 1977, when its name reverted to the Coronet. Panton replaced the seating in the stalls to provide more legroom, reducing total seating to 399. The Coronet had been proposed for listing on five occasions, 1970, 1972, 1973-4 and 1980 without being added to the list. In 1989 the building changed hands again and the purchaser, McDonald’s Hamburgers, submitted an application for planning permission and conservation area consent for the gutting of the building, significant alterations to the facades and its reconstruction as a hamburger restaurant, shops and offices. This would have involved the complete destruction of the theatre interior and major alterations to the exterior. In response to that threat the building was listed Grade II on 11th August 1989. In 1996, a second screen with seating for 151 was opened on the former stage. In 2004 the building was acquired by the Kensington Temple, a large local Pentecostal church congregation. However, it continued to show mainstream cinema programming. In June 2014 The Print Room fringe theatre bought the Coronet Theatre as a permanent base. They have a planned programme of restoration and re-use of the building. I was asked to carry out an analysis of the decorative schemes applied to the interiors. The above sample was taken from a moulding that had originally been gilded. One can see that dark colours were only introduced very recently and that bronze paint replaced the gold leaf. This has been taken from the Heritage Statement produced by The Stephen Gray Consultancy. 31st December 2014.